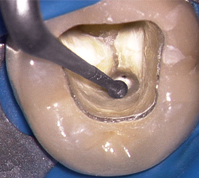 The challenge of every dentist initiating endodontic treatment is to safely prepare and completely finish the access cavity. Today, this procedure can be more predictably performed due to better vision, advancements in ultrasonic instrument designs, and improved clinical techniques. Piezoelectric technology in conjunction with the new SINE Ultrasonic Instruments provide an important breakthrough for access refinement procedures. The SINE tips feature a patented and innovative double composite diamond coating, specially designed working ends, and a water delivery system. Synergistically, these combined features promote precision, efficiency, durability and safety. The specific SINE instrument chosen is based on the appropriate tip configuration required to effectively perform any given procedure. SINE tips should be used with a light brush-cutting motion and are ideal for progressively refining and finishing the access cavity. They may be used dry or wet. In general, ultrasonic instruments are used at the lowest power setting that will efficiently accomplish the clinical task. When performing certain ultrasonic procedures, such as those requiring higher energy levels conducted over longer intervals of time, then water should be used to provide a coolant. SINE-1: 18 mm long, abrasively coated, active pointed tip. SINE-2: 18 mm long, abrasively coated, active rounded tip. SINE Ultrasonic Instruments are for use only with piezoelectric ultrasonic units and work optimally on the Satelec P5 generator (Tulsa Dental Specialties). The instrument whose length, diameter, and tip shape best suits the procedural task should be selected and activated at a low power setting, then the power increased to the point, but not beyond, where the tip is efficiently completing the required task. 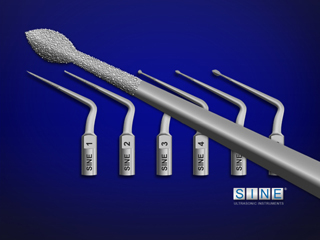 All SINE tips have been designed with water ports. Water port technology affords both a spray and a coolant which some clinicians desire when performing certain clinical procedures. Water is adjusted according to the task at hand, typically a light mist.